Boomanji really isn’t the most exciting offering from BetSoft. It’s very basic in appearance, features, and just about everything. The simplicity might appeal to some players but most will find the lack of bonus stages, animation, and character too dull. Couple this with the fact that there upper betting limit and top jackpot is ludicrously low, you’ve a game that really fails to deliver. It’s a game that’s themed around fireworks. The symbols are all different types of fireworks yet, apart from the background noises, we never actually see a firework go off in the game. It’s puzzling why the designers didn’t include the most (and in truth only) exciting thing about fireworks. Plenty of wins. The game’s low prize structure combined with its special features means it pays out all the time. The wins are small but they’re every other spin. Lack of features. There are no random cash prizes and no free spins on the machine. It feels like a missed opportunity to create a firework themed game that doesn’t have a “pick a firework” bonus where players see their chosen rocket fly into the sky and explode in a shower of colour. Feebly low top prize. It’s not just high rollers who will be put off by the weirdly small £25 a spin betting limit. Low main game prizes. The bonus structure might require it but 250x the line bet for five-of-a-kind using the game’s highest paying simple isn’t so exciting. Three rockets = 250x the line bet. Mega Boom = 120x the line bet. Turbo Boom 60x the line bet. Red rocket = 50x the line bet. Remember wins pay both ways on this slot. So at 5 credits per line bet a top win of 25,000 coins is available. Boomanji is unfortunately lacking in the feature department. 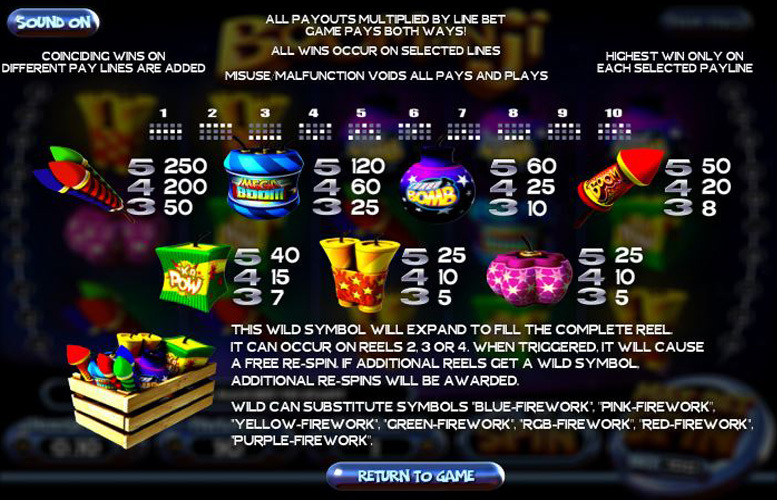 Whilst the expanding “wild” bonus is great and really ups the return-to-player rating, we feel the title could benefit from at least some free spins or similar second screen bonus. The box that includes all the fireworks in the game is the “wild” symbol. It will expand to fill the complete reel and can occur on reels two, three, and four only. When triggered, it will cause a free re-spin. If additional reels have a “wild” symbol land upon them, extra re-spins will be awarded. All ten win lines on Boomanji are paired. This means that winning combinations pay both left to right, and right to left. This can combine with the expanding “wild” feature for some truly spectacular wins. Ka Pow = 40x the line bet. Two yellow bangers = 25x the line bet. Purple firework = 25x the line bet. 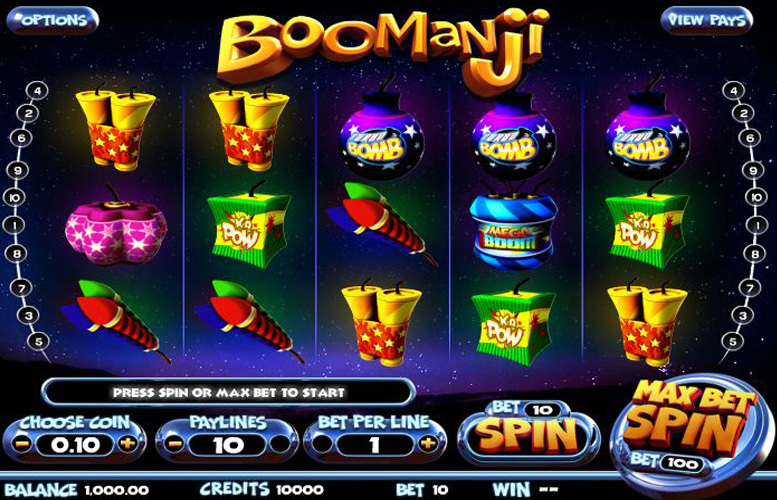 Players are given maximum control over how they distribute their money on Boomanji. They can alter the number of active pay lines between one and 10, and how many coins are bet per line. In addition, they can adjust the value of each of the coins. The lowest is 2p, and the highest, 50p. This means that with all these values set to the minimum, the smallest possible bet per spin is 2p. Meanwhile, the highest is just £25. Whilst not many BetSoft games are aimed at high rollers but Boomanji’s upper betting limit makes the others look positively generous. All told, Boomanji is a let-down. Its lack of features and low prizes mean it quickly gets old and there isn’t even compelling artwork to keep players’ attention. In addition, the game’s upper betting limit is tragically low. Fans of very simple high return-to-player slot machines might get a kick from it but we certainly didn’t consider it a banger.